The Ford motor company has had a parts factory on the Finaghy Road in West Belfast for years. In 1980 there were 1400 employees working there. By the year 2000 that had been reduced to about 550 or 600. At least some of that decline in the labour force is attributable to machinery improvements creating greater efficiency but also a planned run down was begun. In 2000 Ford created a sub-company which was initially called 'Neuco' then renamed 'Visteon' and treated it in some ways as if it was an independent company. Visteon never existed outside of Ford. 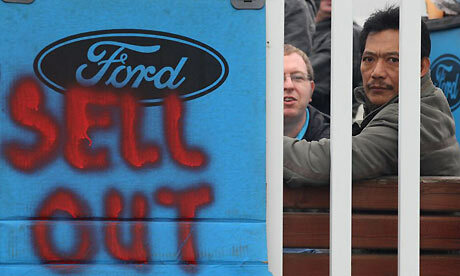 So if anyone was wondering when post-fordism started in Belfast, the Ford motor company would claim it began in 2000. However, the Ford flag still flew over the 'Visteon' factory until last week when workers seized control of their factory after being told that Visteon had been put into administration for bankruptcy. They were given 6 minutes notice that they were losing their job. So they simply stayed in the cafeteria to which they’d been summoned, wouldn't leave the building. When the accountants and management eventually left the premises they didn't let them back in. Now there is a union flag flying over the plant. But for the workers at the Ford/Visteon plant the real issue is still with Ford. In the last 7 or 8 years Ford has deliberately rundown its Visteon plant, encouraging workers to take full pensions, early retirement or a severance deal. From almost 600 workers in 2000 there were 210 people employed in Belfast at the time of the attempted plant closure on Financial Fools day (April 1st 2009). Now that Visteon has been put into administration, neither Ford nor Visteon will have to pay those pensions. According to legislation the government (tax-payer money) is expected to fill the pensions gap. Even so some of the pensioners (4000 total in uk) would have a pension reduction by 10%. Many of the workers are asking each other, was this a deliberate Ford strategy from 2000, to offer full pensions because they knew they would never pay, they knew pension costs would be off-loaded to the public taxpayer! During the Ford/Visteon name exchange the Union had negotiated a separation agreement including promises that the amount of work Ford gave to its new Visteon plants would be equal or better but continually the parts contracts always seemed to be less. The most important negotiation during the name change was that by European Works Council they got guarantee of the same pension, pay raises, holidays, and a mirror contract (The Ford book was orange and said “Ford”, the Visteon book was yellow but otherwise merely a reprint). However anyone with a company dumped into administration can escape all these commitments. Even though many workers that I met had been working in the Belfast plant for 30 or more years, statutory redundancy pay is capped. Because all the parts contracts that Visteon receives come from Ford, the Visteon company is really no more than an internal accounting unit that has been allowed to go bust. For Ford the ‘credit crunch’ may simply be a useful cover for an accounting and legal names hatchet job that was planned years before the bust. Since 2000 the negotiation has been an ongoing process. The 520 agreement said that workers at one of Ford’s ‘Visteon’ plants had the right work in another Ford plant as Ford employees. At one point when a ‘Visteon’ plant in England was shedding jobs many of the employees flowed to a nearby Ford plant and replaced outsourced workers with temporary contracts. The workers at Visteon plants in England have nearby Ford plants in which they are potentially eligible for work, for example the Ford plant in Bridgend was 11 miles from the Swansea Visteon plant. However in Belfast, there is no such nearby plant. The 520 agreement only applies if the workers go to a Ford plant, so obviously the Belfast workers in Finaghy feel this plant closure is ripping the heart out of their community (the majority of whom are from greater Belfast area and a significant minority of which are directly from the immediate Finaghy/West Belfast area. This is perhaps why the focus of the campaign is not on redundancy pay (as has been reported in the news) but rather the focus is on keeping the factory open. “I don’t want a redundancy package,” one worker told me. It was Belfast workers refusal to leave that inspired similar direct action resistance at the two other closing Visteon plants in Basildon and Enfield (England). On Wednesday a supporters’ march with a couple hundred people started at a local shopping centre and walked out to the occupied plant. The Northern Ireland Parades Commission normally requires 28 days notice before any kind of march can happen (because sectarian marches have resulted in violence). However the police were down to the plant the day before to fast track the permission process so that the March could go forward legally. Support for the Belfast workers occupation has so far been very strong from all quarters. Details written here were written down from conversations with occupation workers so some place names/spellings may need checked. More or less, however, the details should be accurate.